In Saint-James, circa 1850, the Legallais family’s spinning plant, Les Filatures de Saint-James, began producing the yarn for the fisherman sweater, fostering its popularity and transforming this regional expertise into a successful industry. To this day, the Saint James atelier and factory is still located in the small village of Saint James, (population: 3000) about 20 kilometers from Mont-Saint-Michel. Saint-James has remained true to its hallmark for over 150 years, producing the highest quality nautical-inspired silhouettes. Saint James still purveys the French Navy and the French Army with their official uniform sweaters. 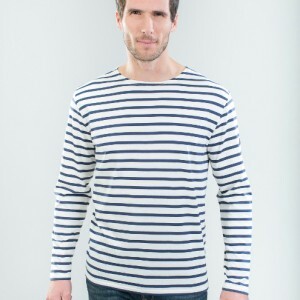 Saint James is the maker of the authentic nautical Breton shirt in combed cotton jersey that has been part of the official French naval uniform since 1871. Saint James is also renowned for the side-buttoned Breton Fisherman Sweater that has been traditionally worn by Breton fishermen since the 19th century. Close-knit quality and double-twist wool meant to protect against sudden gusts of wind and be sturdy enough to withstand strenuous work at sea. It is considered the seafarer’s second skin. In France, Saint James is to stripes and all things nautical the absolute reference.